Eat it like it is. I don’t like onion bagels. I don’t ask for onion bagels. The poor barista seemed new, rushed, overwhelmed. He must have grabbed an onion bagel from the same tray that displayed my beautiful multigrain bagel in front. I didn’t realize it until I tore open the bag an hour later at my desk, ready for my second breakfast. I don’t like them toasted, either. Why bother, when multigrain is so tasty, with just the right amount of cream cheese. 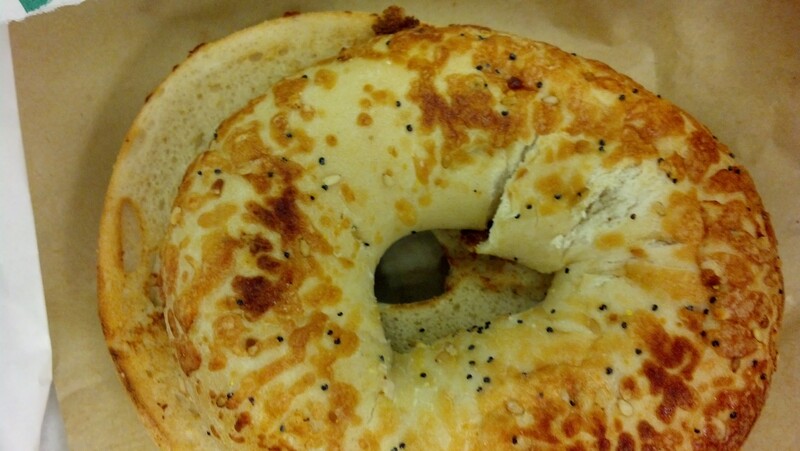 But here I have a toasted onion bagel. For a full minute I had to talk myself down from being on the verge of that cliff–frustration, criticism, blame. The morning ruined. I never would have expressed that sentiment to anyone, of course. It doesn’t fit the impression I would like people to have of me. I would’ve lied. But I would’ve allowed it to color my mood for the morning–already tinted by fitful sleep, my husband leaving town today with the kids while I’m anticipating/dreading a doctor appointment. I had already been lying, wearing the mask of okay-ness. Life is an onion bagel, toasted. It’s perfectly prepared to shatter our masks, challenge ego’s desires, wake us up from self-centeredness, pop our balloon of narrow expectations and demands. Apparently, life wants us to be present for it, to be honest, to be open-hearted. That’s how I say I want to be. It’s a life-long journey. Ram Dass used to quote a surly cook who refused to honor specific requests: “Eat it like it is.” That is my mantra for the day. Taste life, just as it is. Even if it doesn’t meet your requirements. Especially when it doesn’t. Remembering this, as I write, I humbly come back to the present. To my honestly shaky, uncertain existence, my genuinely soft heart. I am grateful to my dharmapala/protector of awareness: a toasted onion bagel. With cream cheese. Thank you for being present and sharing.